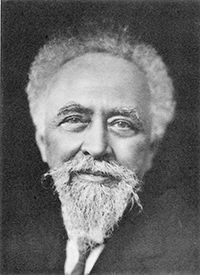 Jean-Baptiste Perrin was awarded the Nobel Prize in Physics in 1926 "for his work on the discontinuous structure of matter, and especially for his discovery of sedimentation equilibrium." His work with Brownian motion verified Albert Einstein’s theory and confirmed the atomic nature of matter. The majority of his career was spent at the University of Paris-Sorbonne. September 30, 1870Birth, Lille (France). approx. 1894Obtained BSc degree, École Normale Supérieure, Paris (France). 1894 – 1897Research Assistant, Physics department, École Normale Supérieure, Paris (France). 1897Obtained PhD, University of Paris (Université de Paris), Paris (France). 1897 – 1940Readership (1897) and Professor of Physical Chemistry (1910-1940), University of Paris-Sorbonne (Université de Paris IV: Paris-Sorbonne), Paris (France). 1912Awarded Vallauri Prize of Bologna. 1914Awarded La Case Prize, French Academy of Sciences (Académie des sciences). 1914 – 1918Officer, Engineer Corps of France. 1923Member, French Academy of Sciences (Académie des sciences). 1926Awarded Nobel Prize in Physics "for his work on the discontinuous structure of matter, and especially for his discovery of sedimentation equilibrium". 1936Appointed Under-Sectretary of State for Scientific Research, France. 1938President, French Academy of Sciences (Académie des sciences). 1938President, French Government Department of Scientific Research (Centre national de la recherche scientifique (France)). 1940Escaped to United States following Nazi invasion of France. April 17, 1942Death, New York (N.Y.). Son and Professor of Mathematics and Physics. Advised by Perrin at University of Paris (Université de Paris). PhD advisor at University of Paris (Université de Paris). Advised by Perrin at University of Paris-Sorbonne (Université de Paris IV: Paris-Sorbonne). Loeb briefly worked in Perrin's laboratory in Paris. Readership and Professor, Physical Chemistry. Member; President; and awarded La Case Prize (1914). Received BSc (approx. 1894) and Research Assistant. Member, attended first and third Solvay Conferences, 1911, 1921. Columbia University Department of Physics Historical Records, 1862-1997. Elizabeth P. Korn sketches, 1928-1940s. French government records concerning the Services des Missions (in charge of scientific expeditions during the 19th century), 1864-1945. Marian Smoluchowski personal archives, 1890-1917. Max Born Jounrey to Russia, 1945. Oral history interview with Edmond H. Bauer, 1963 Janurary 8 and 14. Oral history interview with Georges Allard, 1963 January 10. Oral history interview with Herman Carel Burger, 1962 November 15. Oral history interview with Jean Langevin, 1963 Janurary 11. Oral history interview with Jules Gueron, 1978 April 14, 15, and 21. Oral history interview with Léon Brillouin, 1962 March 29 and 3 April. Oral history interview with Leonard B. Loeb, 1962 August 7. Oral history interview with Louis de Broglie, 1963 January 7 and 14. Oral history interview with René Auguste Lucas, 1963 January 10. À la surface des choses : Physique générale / Par Jean Perrin. Atoms / by Jean Perrin, authorised translation, by D. Ll. Hammick. Die Brown'sche Bewegung und die wahre Existenz der Moleküle / von J. Perrin ; Deutsch von J. Donau. Grains de matière et de lumière / par Jean Perrin. La science et l'espérance / par Jean Perrin ; préfaces de Louis de Broglie [et] Léon Blum. Les atomes / Présentation et compléments par Francis Perrin. Les atomes/ par Jean Perrin. Les éléments da la physique / par Jean Perrin. Notice sur les travaux scientifiques / de Jean Perrin. Oeuvres scientifiques de Jean Perrin / Jean Perrin. Traité de chimie physique : Les Principes / par Jean Perrin. Célébration du centenaire de la naissance de Jean Perrin : sous le haut patronage de Monsiur le Président de la République. Jean Perrin Nobel Prize biography. Molecular reality, a perspective on the scientific work of Jean Perrin. Physics Tree - Jean Perrin, Ph.D.
Royal Society Jean Baptiste Perrin obiturary.